Though the technology seems fairly new to many of us end users, command queuing has been around for years. The idea of reordering the list of requests given to the hard disk drive was first introduced in the SCSI-2 standard and implemented in SCSI drives in the mid-90's. So, why has the technology only just now been given any sort of exposure to the mainstream computer market? Well, most importantly because it has been only recently implemented in consumer class desktop drives. For the last few years, we have been hearing about more and more multithreading technologies like Intel's HyperThreading CPUs and even more recently, Intel and AMD's dual-core architecture. We've been multitasking since the release of Windows 95 and with Moore's Law comes a need for faster technology, and the bottleneck always seems to be the hard disk storage device. Seagate Technologies has been a major player in the storage device game for quite some time and have also just entered the command queuing game as Maxtor did last year with its MaXLine III series hard drives with Native Command Queuing. Like Maxtor, Seagate has been able to design a native SATA drive with Native Command Queuing, while also increasing the drive's capacity to 400GB with its 7200.8 line, which is 33% larger than Maxtor's largest drives (300GB). The Barracuda 7200.8 line builds on the 7200.7 line with the NCQ feature as well as 4 capacities including 200GB, 250GB, 300GB, and a 400GB, which we will be reviewing. The 400GB unit utilizes a three-133GB platter design, while the 250GB drive uses two 133GB platters. The 200GB and 300GB drives both use the older 100GB platter design. The 7200.8 line still has an 8MB cache, though, which may keep it from competing directly with Maxtor's DiamondMax 10 NCQ drive that holds a 16MB buffer. When we first received our test units from Seagate, we noticed that the two drives had different controller chip/memory combinations on them (Agere/Samsung, STMicroelectronics/EtronTech). Seagate explained to us that they used various suppliers for their controller chips and that even though the chips are from different manufacturers, the drives are designed from the same specifications. 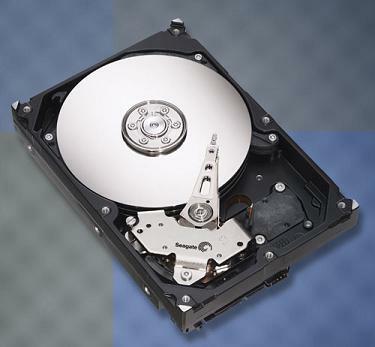 Inside the Barracuda 7200.8, Seagate has implemented their own version of a fluid dynamic bearing motor called SoftSonic. Their quiet motor technology is said to produce very little sound, but Seagate's specifications for the 7200.8 line says different as the drive specs list a higher bel rating than the 7200.7 line. We'll take a look at these numbers more later in our acoustic tests. Special thanks to NewEgg.com for providing us with the products for this review. segagenesis: It seems to be an issue with our sound meter or noise reduction process. We will look into it for our next review. Besides the echo, the recordings should be clear enough to differentiate how each drive sounds. You know, with all this talk about NCQ, 1 question has not yet been answered: how does it work with RAID? Can you use NCQ on a RAID system? Also, I'd like to see these tests run on a RAID system, see the performance advantage it gives. Maybe compare 2 cheap, somewhat slower drives in a RAID array against a single HD that you can get for the same price? The benchmarks are hardly cut and dry yes, but I do enjoy the fact Seagate has a 5 year warranty on drives. This after seeing the industry at one point was putting out 1-year warranty stock on drives and if you paid extra, 3 years. Raptors are the fastest drives ive ever seen but the lack of space keeps them from being all inclusive. I was kind of suprised that the 7200.8 beat out the Raptor as far as game loading went! man, I need to learn how to use this...anyways...I bought 40 of these drives for my company. 16 goes into one raid and another 16 goes into another raid. So far so good, I hear no complaints from my tech guys.